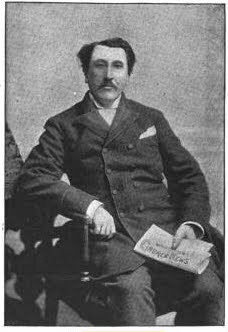 William Chatterton Dix was born in Bristol, England on June 14, 1837, the son of John Dix, an author, poet, and surgeon, and Susan (or Susannah) Moore. John Dix wrote a biography, The Life of Thomas Chatterton (1837), and gave his son who was born the same year the middle name of Chatterton in the poet's honor. William attended the Bristol Grammar School for a commercial career, and then attended a private school, during which time he worked for his maternal grandfather, William Moore, who operated a soap and candle-making business at 125 Redcliff Street, Bristol. William attended a High Anglican church, St. Raphael, whose pastor was the Rev. Arthur H. Ward; William would later contribute a hymn, As With Gladness Men Of Old (Version 2), to Ward's hymnal, Hymns for the Services of the Church and for Private Devotion (circa 1860). Francis Jones, Famous Hymns And Their Authors. 2nd (1903), opposite p. 316. Clifton is a neighborhood in Bristol, England where Mr. Dix was born and raised. His early life was marred because of the actions of his father, John, who was, unfortunately, addicted to alcohol, and evidently unable to control his behavior. His practice as a doctor in Monmouth, Wales, failed, and he was imprisoned for non-payment of debts. He then abandoned his family and moved to America by at least 1845 by having "obtained a passage as surgeon in an emigrant ship" - this was when William was 8 years old. John supported himself by publishing an assortment of books, primarily of the pen-and-ink variety. He returned to England briefly in 1847, but by 1850 he had returned to America. His last book, A Hand Book for Lake Memphremagog, was published 1860 (reprinted 1864), and thereafter there is no record of him. By the time of the census of 1861, his wife was listing her marital status as "widow." It is necessary to sometimes nail up fresh vermin on the barn-door of infamy, already sufficiently crowded. One of the most shameless literary forgers of the present century was John Dix, alias John Ross a man who wrote a short 8vo Life of Chatterton, which was published in Bristol in 1837. The debacle of John Dix would continue to be explored in their pages for several months, certainly inflicting emotional damage upon the family. See: The Barn-Door Of Infamy. While in his early 20s, William worked as a clerk for his maternal grandfather, William Moore, in the latter's soap and candle making business in Bristol. On June 30, 1864, at age 27, he married Juliet Wartnaby. According to some sources, the couple then moved to Glascow, Scotland where he became broker in a marine insurance company, and later it's manager, while he and his wife raised their seven children. It is important to note that research conducted by Professor Sheila Rowbotham shows that William and Juliet were living in England in 1871 and at the same address in 1881. Prof. Rowbotham has given other important details about the life of William Chatterton Dix in her excellent work Rebel Crossings (London: Verso, 2016). In 1866, at the age of 29, he was struck with a near-fatal illness and consequently was confined to his bed for several months. During this time he became severely depressed. Much of his poetry stems from this time and in the years immediately following this illness. In this regard, Francis Arthur Jones wrote that "Not a great while before his death Mr. Chatterton Dix sent me a manuscript copy of his hymn: — 'Come Unto Me, Ye Weary'  together with a few remarks as to the circumstances under which he composed it. "I was ill and depressed at the time," he says, " and it was almost to idle away the hours that I wrote the hymn. I had been ill for many weeks, and felt weary and faint, and the hymn really expresses the languidness of body from which I was suffering at the time. Soon after its composition — and it took me some time to write out, for my hand trembled, and I could with difficulty hold the pen — I recovered, and I always look back to that hymn as the turning-point in my illness. It is a somewhat curious fact that most of my best known hymns were written when I was suffering from some bodily ailment." Although it is believed that he was in the insurance business, his heart was in the poetry of worship. It has been said of him that "Few modern writers have shown so signal a gift as his for the difficult art of hymn-writing." He wrote more than 200 poems and hymns over the course of his life, over 40 of them related to the Christmas-tide. Perhaps the most widely known of these is What Child Is This?, which was written about 1865, as well as The Manger Throne. His fine Epiphany hymn, As, With Gladness, Men Of Old (1859) and his plaintive "Come unto Me, ye weary," are prime examples of his compositions, many of which rank among the finest and most beloved hymns. Hymns of Love and Joy, 1859, with contained the first version of As, With Gladness, Men Of Old. Seekers of a City, 1878, no copy of which as been seen to date (January 15, 2018). WorldCat reports only two known copies, one at the British Library, and the other in the library at Florida State University, Tallahassee. I hope to travel there soon to examine this volume. The greater part, however, were contributed to Hymns, Ancient & Modern, 1861 et seq. ; St. Raphael's Hymn Book, ca. 1860; Lyra Eucharistica, 1863; Lyra Messianica, 1864; Lyra Mystica, 1865; The People's Hymnal, 1867; The Hymnary, 1872; Church Hymns, 1872, and others. He also published a number of hymns in assorted religious journals of the day. Editor's Note. Although the common name was St. Raphael's Hymn Book, the correct title is Hymns for the Services of the Church and for Private Devotion. It was edited by A. H. Ward for the Church of St. Raphael in Bristol. An Eucharistic Meditation, #44, p. 50; "Jesu, We Laud And Worship Thee." The Two Thrones, #70, p. 86; "Lift Up Your Songs, Ye Angel-choirs." The House of Bread, #182, p. 229; "Jesus, True God, True Man We Adore Thee." The Early Christian's Eucharist, #257, p. 332; "Through The Long Hidden Yars Thou Hast Sought Me." Bethlehem Hath Opened Eden - St. Romanus the Melodist, Τήν Έδέμ Βηδλεέμ ήνοιξε, δεύτε ίδωμεν. Habakkuk In Ancient Song - St. John of Damascus, Γενους Βροτέιου τήν άνάπλασιν πάλαι, from the Canon of Christmas Day, Ode 4. Bend To Our Hymns, Redeemer - St. John of Damascus, Νευσον πρός ύμνους, οίχετων εύεξγέτα, from the Canon of Christmas Day, Ode 3. The Wonder-Working Master - St. John of Damascus, Εσωσε λαόν, δαυματουργών, from the Canon of Christmas Day, Ode 1. The Embracing of the Body of Christ By His Virgin-Mother, translation of the Greek of Symeon Metaphastes, #11, p. 36; "Thou Uncoverse Corse, Word of the Living One." Pentecostal Odes from the Service-Books of the Holy Eastern Church, #60, p. 201; "We Keep the Feast of Pentecost." The Prodigal's Return, #130, p. 417; "Almighty Father, Lord of All." No Songs Shall Break Our Gloom (Good Friday), #89, pp. 85-86. O Lord, The Wilderness To Me (Lent), #79, p. 76. Put On Thy Beautiful Robes, Bride of Christ (Easter), #108, pp. 105-106. Accept Our Thanks, O Lord, #252. First Publication. In The Hollow Of Thy Hand, #316. First Publication. Lift Up Your Songs, Ye Thankful, #245. First Publication. Now In Numbers Soft And Flowing, #303. O Cross Which Only Canst Allay, #529. First Publication. Only One Prayer To-day, #73. Sitting At The Receipt of Custom, #282. First Publication. To Thee, O Lord, Our Hearts, #339. First Publication. As With Gladness Men Of Old (Epiphany), #178, p. 150. The Church Of God Lifts Up Her Voice (Easter), #286, p. 260. The Cross is On Our Brow (Confirmation), #501, p. 460. Joy Fills Our Inmost Heart To-day (Christmas), #83, pp. 68-69. As With Gladness Men Of Old (Epiphany), #94, pp. 78-79. O Thou, The Eternal Son Of God (Good Friday), #121, p. 101. To Thee, O Lord, Our Hearts We Raise (Harvest), #281, pp. 248-249. Holy, Holy, Holy, To Thee Our Vows We Pay (Anniversary of Dedication of Church Building), #314, pp. 281-282. On The Waters Dark And Drear (For Use At Sea), #325, p. 293. Alleluia! Sing To Jesus! (General Hymn of Praise), #332, p. 300. Come Unto Me, Ye Weary (General Hymn of Comfort), #351, p. 316. How Long, O Lord, How Long, We Ask (General Hymn, the Second Coming), #385, pp. 344-345. In Our Work, And In Our Play (Children's Hymn), #573, p. 503. #38, "Alleluia! Fairest Morning" (Morning), pp. 33-34. This was a translation of "Hallelujah! Schoener Morgen!" by Rev. Jonathan Krause (1701-1762), 1739, Translation by Jane Laurie Borthwick (1813-1897), originally as "Hallelujah! Fairest Morning," Hymns from the Land of Luther, 3rd Edition. (1858). In the 1869 Edition, the hymn can be found on pp. 130-133. #248, "Let No Tears To-day Be Shed" (Burial of a Child), #248, pp. 221-222. The author was Richard Frederick Littledale. A number of his contributions are renderings in metrical form of Dr. Littledale's translations from the Greek in his Offices from the Service Books of the Holy Eastern Church, 1863; and of the Rev. J. M. Rodwell's translations of hymns of the Abyssinian Church. Dr. Julian felt that these renderings of the "songs of other Churches" have not received the attention they deserve, and the sources from whence they come are practically unknown to most hymnal compilers. Editor's Note. Examples of translations by Dix of Greek & Eastern hymns can be found in Rev. Orby Shipley, ed., Lyra Messianica: Hymns and Verses on the Life of Christ (London: Longman, Green, Longman, Roberts, and Green, 1864), above. See generally: Christmas-tide Hymns from the Eastern Churches. Dr. Julian reports that there was a a second, earlier metrical translation of the Abyssinian hymn, "The Vigil of the Four Beasts" in the Churchman's Shilling Magazine for May, 1867, plus "an additional translation or two by Mr. Dix" in Church Times. No copy is available as of Feb. 10, 2018. Some of Rodwell's translations were in an article titled "Translations from the Æthiopic," which was printed in B. Harris Cowper, ed., The Journal of Sacred Literature and Biblical Record. Vol. VIII (New Series), No. 16, January 1866 (London: Williams and Norgate, 1866), pp. 321-337. These and other Æthiopic hymns can be found in Rev. J. M. Rodwell, ed., Æthiopic Liturgies and Prayers. Translated from Mss. in the Library of the British Museum and of the British and Foreign Bible Society, and from the Edition Printed at Rome in 1548. No. I & II (London: Williams & Norgate, 1864). The Holy Childhood. Verses, Illustrated, from W. Chatterton Dix. (Oxford, 1890). No. 8 of Mowbray's Illustrated Oxford Broadsheets. Several of these works have not yet been digitalized. Accept Our Thanks, O Lord, We Pray. [St. Bede] Julian, p. 9. Alleluia, Sing To Jesus. [Holy Communion] Julian, p. 49. As Morn To Night Succeeds. [Victory Through Suffering] Julian, p. 84. As Those Who Seek The Break Of Day. [Easter] Translation of a Greek hymn, which honors the holy women who brought spices to anoint the body of Jesus on the Sunday following the Crucifixion. Julian, p. 1182. Christ, we sing Thy saving passion [Easter] Translation of a Greek hymn, from the Office for the Sunday of Easter, Littledale, Offices of the Holy Eastern Church, 1863, p. 95. Julian, p. 1190. The Church of God Lifts Up Her Voice. [Easter] Translation of the anonymous Greek hymn. Julian, p. 1146. Come Unto Me, Ye weary. [Invitation] This hymn, which ranks as one of the best of Mr. Dix's efforts, was published in the People's Hymnal (1867), p. 253. If The Dark And Awful Tomb [Easter] Translation of a Greek hymn by St. John of Damascus. p. 322. Jesu, Give Thy Servants [Whitsuntide] Translation of a Greek hymn by St. John Arclas. Julian, p. 1116. Lift Up Your Songs, Ye Angel Choirs. [Ascension] From Altar Songs, 1867. Julian, p. 1559. No Songs Shall Break Our Gloom Today. [Good Friday] Julian, p. 808. Now, My Soul Rehearse The Story. [Christ Feeding the Multitude] From Altar Songs, 1867. Julian, p. 1559. O Blessed Trinity, included in Hymns For Use During 1887 The Year of the Jubilee of Queen Victoria. O Joyful Light of God Most High [Evensong.] Translation of an anonymous Greek hymn before the 4th century, which was sung at the Lighting of the Lamps, and known as "The Candlelight Hymn." Julian, p. 894. O Ye, Who Search For Jesus, Raise. [The Transfiguration.] Translation of the cento Quicumque Christum quaeritis [Epiphany] by Prudentius, the 12 and last poem of his Cathemerinon, 5th Century. Though one of the finest poems of Prudentius. Julian, p. 946. To Thee, O Lord, our hearts we raise. [Harvest.] One of six hymns at the end of St. Raphael's, Bristol, Hymns for the Service of the Church, 1864, #202. The note is for the next hymn, #203 The Church of God Lifts Up Her Voice. Julian, p. 1180. This hymn was included in Hymns For Use During 1887 The Year of the Jubilee of Queen Victoria. Within The Temple's Hallowed Courts. [B. V. M.] From Altar Songs, 1867. Julian, p. 1559. 1. God Cometh, Let The Heart Prepare ("Judgment At The Door") Advent/Second Advent. In his A Vision of All Saints, &c, 1871. 2. Holy, holy, holy, to Thee our vows we pay. Holy Communion. Published in his Altar Songs, 1867, in 6 stanzas of 6 lines, and headed "Eucharistic Processional for Dedication Feast." In the S. P. C. K. Church Hymns, 1871, and others in an abridged form. 3. How Long, O Lord, How Long, We Ask. Second Advent. Appeared in the Appendix to the S. P. C. K. Psalms & Hymns, 1869, and repeated in several collections. 4. In our work and in our play. Children's Hymn. Published in his Hymns and Carols for Children, 1869, and is largely adopted in children's hymn-books, as Mrs. Brock's Children's Hymn Book, 1881, and others. Also in the S. P. C. K. Church Hymns, 1871. 5. In the hollow of Thine hand. For Fair Weather. Appeared in the People's Hymnal, 1867, and repeated in several others. 6. Joy Fills Our Inmost Hearts Today!. Christmas. Printed in the Church Times, and then on a Fly-Sheet by G. J. Palmer, as the third of Four Joyful Hymns for Christmas, circa 1865. It is in the S. P. C. K. Church Hymns, 1871, and other hymnals. It is also one of Mr. Dix's Christmas Customs & Christmas Carols, N.D., and Hymns and Carols for Children, 1869. 7. Lift up your songs, ye thankful. St. Ambrose. Contributed to the People's Hymnal, 1867. 8. Now in numbers softly flowing. St. Cecilia. Contributed to the People's Hymnal, 1867. 9. Now, our Father, we adore Thee. Praise to the Father. Appeared in the Appendix to the S. P. C. K. Psalms & Hymns, 1869. 10. O Christ, Thou Son of Mary. St. Crispin. First printed in the Union Review, Sept., 1866, and thence into the People's Hymnal, 1887. 11. O Cross which only canst allay. Glorying and Trusting in the Cross. Published in the People's Hymnal, 1867. 12. O Thou the Eternal Son of God. Good Friday. Appeared in Lyra Messianica, 1864; the author's Hymns and Carols for Children, 1869; the S. P. C. K. Church Hymns, 1871, &c.
13. On the waters dark and drear. For use at Sea. Published in Hymns for Public Worship, &c. (St. Raphael's, Bristol), 1861; the S. P. C. K. Church Hymns, 1871, &c.
14. Only one prayer to-day. Ash-Wednesday. Contributed to the People's Hymnal, 1867. 15. Sitting at receipt of custom. St. Matthew. Appeared in the People's Hymnal, 1867. 16. The Cross is on thy brow. Confirmation. In the 1869 Appendix to the S. P. C. K. Psalms & Hymns. 17. The stars above our head. Work and Humility. In the 1869 Appendix to the S. P. C. K. Psalms & Hymns. 18. When the shades of night are falling. Evening Hymn to the Good Shepherd. In the author's Seekers of a City, &c. .
Dr. Julian writes that most of Mr. Dix's best-known hymns, and also some of those named above, are in Common Use in America and other English-speaking countries. In Great Britain and America from 30 to 40 are in Common Use. His total number of poems and hymns is over 200. Joy Fills Our Inmost Hearts Today, The Royal Child Is Born! It Was The Quiet Evening - "The Legend of the Holy Child"
Emmanuel: Joy Fills Our Inmost Hearts Today, The Royal Child Is Born! The sheet music was published in The Musical Times and Singing Class Circular, Vol. 31, No. 574, Dec. 1, 1890, pages 735-738. Mr. W. Chatterton Dix, the author of “Come unto Me, ye weary,” “As with gladness men of old,” and other well-known hymns, is, happily, one of our living hymnists, and at present resides in Clifton. Mr. Dix was born in 1837, and began writing hymns at a very early age. “Come unto Me, ye weary,” which I have chosen for reproduction here, and which the author kindly sent me for the purpose, was written about the year 1867 [Dix was about 30 at the time. Ed.]. The hymn has not altogether escaped alteration at the editor’s hands, though in a lesser degree than the compositions of many other contributors to hymnody. Mr. Chatterton Dix informs me that there is no particular story connected with the writing of the hymn, save that he was ill and depressed at the time. Source: Francis Arthur Jones, "Some Popular Hymns, and How They Were Written," in George Newnes, ed., The Strand Magazine. An Illustrated Monthly. Vol. IX. January To June. (London: Newnes, Ltd., 1895), p. 588. 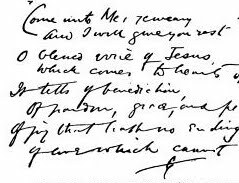 The handwritten excerpt from Dix's hymn "Come Unto Me Ye Weary," was from the same article. The photograph of Dix was also on p. 588, with credit to "Lurden Hall, Clifton." This attribution, however, was in error. The photographer was Frederick Lindon Hatt (1844-1919), who operated studios in Clifton, Bristol, from 1883 through 1911 under the name of "Lindon Hatt" and "Lindon Hatt & Son." Source: The Hatt Family of Photographers, accessed Feb. 14, 2018. Clifton is a neighborhood within Bristol. Sometime between 1895 and 1898, the Dix family moved from Clifton to Cheddar, some 40 miles southeast of Bristol. The death is announced of William Chatterton Dix, the writer of many popular hymns. Born in 1837, Mr. Dix had, therefore, reached his 61nd [sic] year. For a long time he was a resident of Bristol, but lately he removed his residence to Cheddar, where he died on Friday last. He had contributed hymns to “Hymns Ancient and Modern," “The Hymnary,” “The People’s Hymnal,” “The Hymnal Companion," “The Scottish Hymnal," and most of the denominational collections in England and America, some of them being also translated by missionaries into African and other dialects. The author of such beautiful hymns as “Come unto Me ye Weary,” and “As with gladness men of old,” will long be remembered. There was apparently an obituary in The Illustrated London News, 24 September 1898. An accompanying photograph credited to "Lindon Holt" (sic). A copy of the photograph is available for purchase from Look and Learn History Picture Library. Dix was buried in the Church of St. Andrew, Cheddar, about 40 miles southwest of the city of his birth, Bristol. We have found no book-length biography, unfortunately. We believe that he had 2 sisters, and although two biographies have mentioned raising a large family, none has given any significant details concerning marriage or children. Juliet Dix - his wife, Juliet Wartnaby, married June 30, 1864. Gertrude was another daughter, the eldest. Research is continuing, and I hope to add additional details concerning the life of W.C. Dix. Any help would be greatly appreciated and acknowledged. I would again note that Professor Sheila Rowbotham has given important details about the life of William Chatterton Dix in her excellent work Rebel Crossings (London: Verso, 2016). God Cometh, Let The Heart Prepare ("Judgment At The Door") Advent/Second Advent. How Long, O Lord, How Long, We Ask. Second Advent. Joy Fills Our Inmost Hearts Today, The Royal Child Is Born! Christmas. Works of William Chatterton Dix at Wikisource. All links open in a new window at an external site. Robert H. Baynes, Ed., The Churchman's Shilling Magazine And Family Treasury. Vol. 2, September 1867-February 1868 (London: Houlston and Wright, 1868), "Abyssinian Hymns," October 1867, pp. 212-217. Edwin Francis Hatfield, The Poets of the Church (A. D. F. Randolph & Company, 1884), p. 195. John Julian, Dictionary of Hymnology (1892, 1907), pp. 302-303. Francis Arthur Jones, Famous Hymns And Their Authors. (London: Hodder and Stoughton, 1903), , pp. 63-64, 322-323. Alfred H. Miles, ed. The Sacred Poets of the Nineteenth Century. 1907. Alfred H. Miles, Critical and Biographical Essay (London: George Routledge, 1907). The Monthly Packet of Evening Readings for Members of the English Church. New Series, Volume 6 (July-December, 1868) (London: John and Charles Mozley, 1868), "Devotions of the Abyssinian Church," pp. 4-7. Roundell Palmer, Earl of Selborne, English Church Hymnody. A lecture read at the Church Congress, York, Oct. 11, 1866 (London and Cambridge: Macmillan and Co., 1867), pp. 45-46. Roundell Palmer, Earl of Selborne, ed., The Book of Praise. Boston: Sever, Francis, & Co., 1870, # XLI, p. 48. Godfrey Thring, ed., A Church of England Hymn Book: Adapted To The Daily Services Of The Church Throughout The Year. (London: W. Skeffington & Son, 1880).